After a long and busy day in which we did the Myvatn Nature Baths, Krafla, and the particularly foul Hverir, it was time for dinner. 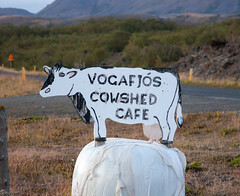 On the way to and from our hotel, on the East side of Lake Myvatn, we saw a simple hand-drawn sign sitting on an old wrapped hay bale saying “Vogafjós Cowshed Cafe”. Many people might pass this by. In fact, in many locales I’d say the majority of people would pass it by. We didn’t, however, for several reasons. First, the greater Myvatn/Reykjahlíð area isn’t exactly teeming with restaurants; indeed, Vogafjós is one of about three places to eat in that general vicinity (and I ate at one of the other places the next night. Second, several online sources had mentioned Vogafjós as a neat place to check out. And finally, this is exactly the sort of quirky place I like to look for. The correct answer is “All of the Above” (although “Bed and Breakfast” is almost a given in rural Iceland, especially before people starting building tourist hotels in Iceland, farmers renting out rooms and serving meals to guests has been a time-honored tradition in Iceland, and there’s even an organized network for it: http://www.farmholidays.is/ which I will probably use next time I visit). But until you’ve been there, it’s really hard to appreciate what a combination cowshed and restaurant is like. 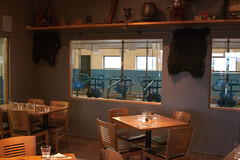 Really, they built the restaurant inside the cowshed, so many of the tables are a few feet away from the milking stalls (check out the picture). 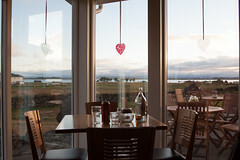 But while the novelty of eating my food a few feet away from the cows is cool, I couldn’t pass up the first seat we were offered on the other side of the restaurant, looking out over Lake Myvatn at sunset. As far as the food goes at Vogafjós, they have exactly the sort of menu you’d expect of a place built inside a cowshed, with a nice variety of fresh house-made cheeses, local meats, and Icelandic specialties. We started out with a simple dish: a Mozzarella and Tomato appetizer. Made with house-made mozzarella, this was excellent; the mozzarella was exactly the texture I like in a fresh cheese, the tomatoes were nicely tangy, and it was assembled into a nice little salad. This was a great start to the meal. Next up: cocktails. The national drink of Iceland is Brennivin (literally, “Fire Wine”), a rather strong schnapps-style beverage brewed from potatoes and flavored with caraway seeds. Straight up, I’ll have to say, it’s not a drink for the faint of heart, and is definitely more than a bit of an acquired taste (to my family, I’ll say that it tastes vaguely like liquified Lithuanian rye bread with a hint of lighter fuel). But with a little bit of blueberry liqueur, Vogafjós manages to convert Brennivin into a surprisingly pleasant “Icelandic Martini”, which we both actually enjoyed. Next up were the main courses. Carol opted for the dish that we found to generally be a guaranteed win in Iceland: the lamb chops. And these were some seriously good lamb chops: flavorful and tender, but cooked up with a nice sear and cooked just to the point the fat was going to melt. 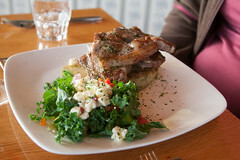 A nice perfect stack of lamb chops, and a nice side salad of kale and house-made cheese. 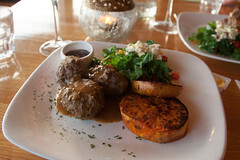 I opted for another simple-sounding dish: the meatballs. And let me tell you, these weren’t your standard Ikea meatballs (much as I like those), but robust and flavorful meatballs with a moist interior and a nice sear. Add in some nice rhubarb sauce, and the same kale and house-made cheese salad that Carol had, and this was also an excellent main course. Dessert, however, will stick in my mind. After seeing several other tables order up ice cream, we decided to do the same. 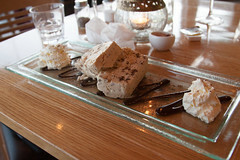 Carol got the Angelica ice cream, flavored with one of Iceland’s most prominent local herbs. I, however, opted for the other ice cream flavor: Geysir bread Ice Cream, featuring chunks of dark rye bread cooked in hot steamy water from the local geothermal source. The result was the most delicious items I ate in Iceland, a near-perfect (the ice cream was a little over-frozen) combination of textures and flavors that was both unique and flavorful, like a good bread pudding meeting up with a good ice cream. I’d get this again in a heartbeat, and will probably have to break out my own ice cream maker to experiment. One of the big questions I get from people is “How do you find the places you eat?” There are many answers to this, but the primary two answers are “research” and “happenstance”. Mad Madeline’s Grill was a good example of the latter. We were visiting Temecula with Carol’s sister and her boyfriend, and walking down the street we passed by Mad Madeline’s. I didn’t even need to look inside to know that this was going to be a good burger joint. Walking by on the sidewalk, I walked through three successive bands of smells. First was the smoker. Second was the smell of nicely seared beef. The third was a fry cooker. It certainly smelled like a good burger joint.